Originality – Chocolate Strawberry is the hot new flavor for adults so it makes sense for Special K to try their hand at it with Strawberries and chocolate slivers. Aftertaste – The chocolate had an aftertaste to it that was not all that pleasant. Mouth Feel – It is like Special K crunch with pieces of freeze dried strawberries and slivers of chocolate. 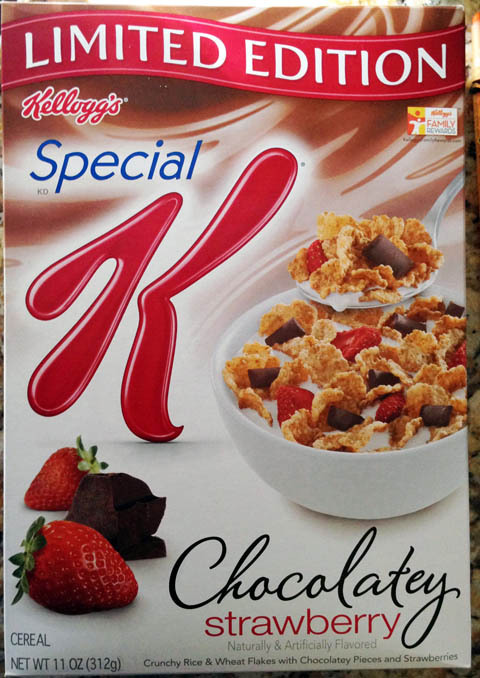 Sweetness – It was not overly sweet at all, the strawberries and chocolate made it have a more flavor than regular Special K.
Flavor – The flakes and strawberries were fine, but the chocolate quality was not up to par and was very waxy. For a cereal like this I think they should have upped the quality of the chocolate to make this a high-end cereal for the adults. That may be the difference that while kids can’t really tell, parents can tell different quality of chocolate. Look – Special K with good-looking and sized strawberries and waxy looking chocolate slivers. Packaging – The packing is a bit over exaggerated with the look of the strawberries and chocolate. The strawberries are freeze-dried so they aren’t as plump as they look, I guess you could let them sit in the milk longer, but then your flakes will get too soggy. The chocolate did not look like that at all in my bowl. Around the Table – I think Kid C giving it a 1 was generous on his part based on the look on his face. While both Jocelin Cap and myself were not impressed with the cereal we did realize that if you got strawberry and chocolate on the same spoonful it did make it taste a bit better. Can’t fault Kellogg’s Special K for trying to tap a new flavor for its audience, I just don’t think this one worked for us. If I was going Special K I would rather cut my own fruit to put it in it.